Regardless of the method used to produce more torque, it's a scientific fact that the more torque the engine produces the LESS fuel it needs and the more peak horsepower the engine produces at high rpm the MORE fuel it uses. This is the reason low rpm torque engines produce much better fuel economy than high rpm horsepower engines. This is a typical fuel curve graph that compares the fuel consumption to the engine's torque curve. Note how the 2 curves are almost mirror images of each other. 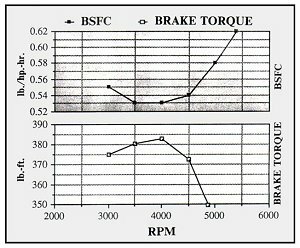 The fuel curve graph shows that the more torque the engine produces the lower the fuel consumption is which is shown by the lower BSFC number. The graph also shows that the higher the rpm the higher the fuel consumption is which is shown by the higher BSFC number.